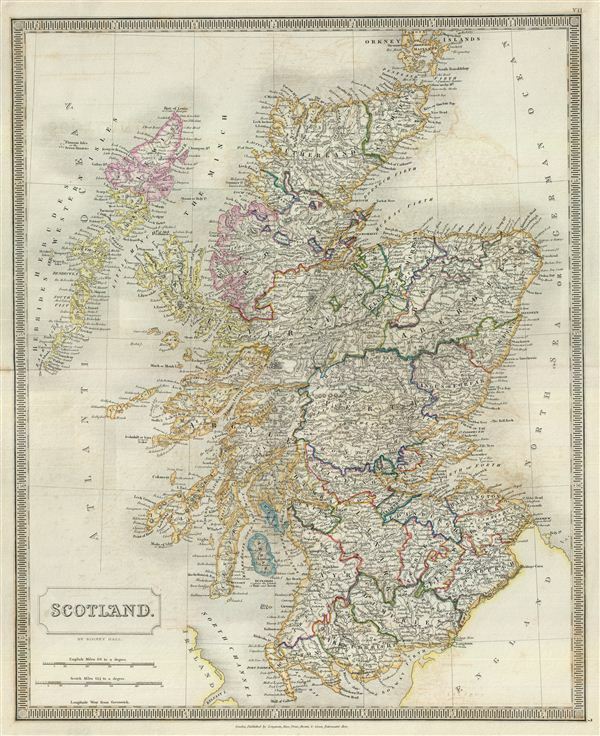 This is a beautiful map of Scotland from Sidney Hall's extremely scarce 1835 New General Atlas. It covers Scotland from the Orkney Islands to Wigton in the south inclusive of the Hebrides. Towns, rivers, mountains, railroads, battle sites, and various other important topographical details are noted. Elevation throughout is rendered by hachure and political and territorial boundaries are outlined in color. Hall's map marks the site of the Antonine Wall, fortifications built by the Roman Empire to defend against the unruly tribes to the north, but it is not specifically named. Several battlegrounds, including the Battle of Falkirk in 1298 and 1746, the battle of Dunbar in 1296 and 1650, and the battle of Solway Moss in 1542, among others are noted. The Bell Rock, home to the world's oldest surviving sea-washed lighthouse is also identified. The legendary story of the Bell Rock or the Inchcape was made famous by Robert Southey's poem 'The Inchcape Rock.' This map was issued in the midst of Scotland's Industrial Revolution, in which it emerged as a regional center for engineering and shipbuilding. This map notes towns, rivers, mountains, railroads, battle sites, and various other important topographical details. Elevation throughout is rendered by hachure and political and territorial boundaries are outlined in color. Very good. Original platemark visible. Minor wear along original centerfold. Minor offsetting. Blank on verso. Rumsey 4224.007 (1830 edition). Philips (Atlases) 758. Ristow, W., American Maps and Mapmakers: Commercial Cartography in the Nineteenth Century, p. 303-09.